'Time for something new' is the slogan that covers the windows of the previously unused bar front that we have taken residence in for the summer. We have transformed what was otherwise an empty unit space in East Village into a creative education paradise. Mismatched chairs and sofas contrast against the bare interiors to create the most individual place for keen learners to try something for the first time. We'll be spending the summer filling the space with incredible workshops from independent makers and teachers from the local area. 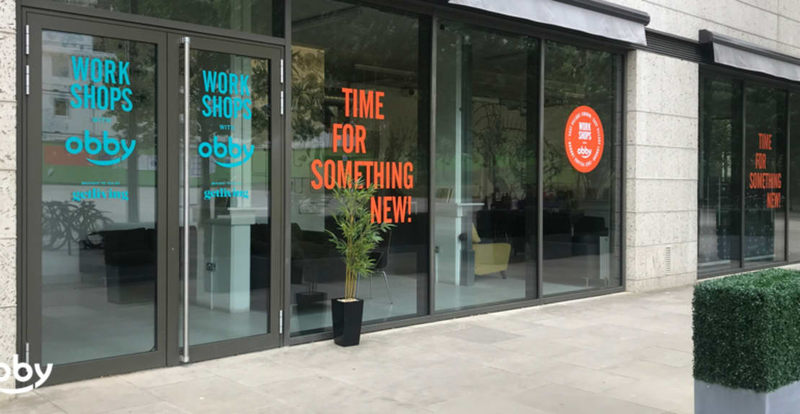 We want to bring something new to the table, so we'll be encouraging our existing teachers to think outside the box to bring something extra special to the Obby Pop Up. There's a huge community feel in the area, with various projects, groups and amazing parks and restaurants. We are working closely with Get Living London to contribute to that, encouraging the residents of the area to use our space to practice their hobbies, find new talents and make friends and connections in the area and the rest of London with similar interests. In terms of how the new Pop Up will help expand and grow our existing collective talented creators, makers and artists, we are using this opportunity of a 'storefront' to offer a free venue to any of our teachers. We want to extend the platform we provide so that they can pass on their skills with even more ease. After speaking to our teachers, it became clear that finding venue spaces in London is a nightmare because of several reasons, including extortionate pricing and difficult cancellation terms. We've committed to 6 months for our Pop Up venue to introduce this as part of our service, so we can encourage even more of London's talented folk to start teaching classes!